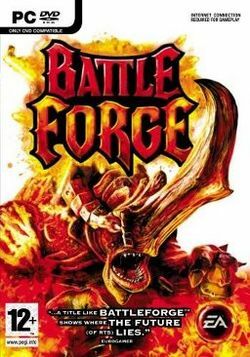 BattleForge is a video game developed by EA Phenomic and published by Electronic Arts. It was released on Windows in March 2009, with a demo released in the same month. BattleForge is a card based RTS, revolving around trading, buying and winning through means of micro-transactions. Micro-transactions are not required for playing the game, only for buying new cards. On May 26, 2009, BattleForge became a Play 4 Free branded game with only 32 of the 200 cards available. In order to get additional cards, players will now need to buy points on the BattleForge website. The retail version comes with 64 cards and 3,000 BattleForge points. There are a total of 200 cards available, equally divided between the powers of fire, frost, nature, and shadow. Players can buy and sell cards at an in-game auction house, using BattleForge Points (BF Points), an in-game currency. Players can also invite each other to conduct a direct trade. This page was last edited on 13 June 2013, at 04:11.